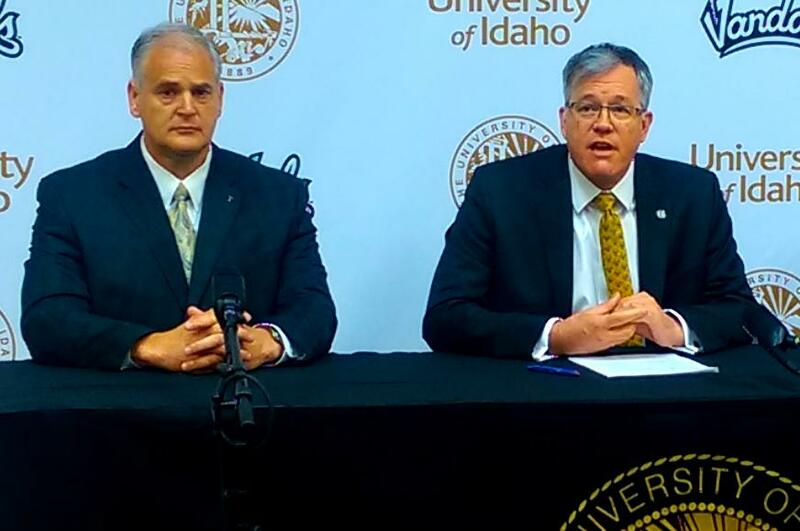 MOSCOW, Idaho – One day before an Associated Students of the University of Idaho vote on whether athletics director Rob Spear should be fired, UI president Chuck Staben announced he is placing Spear on a 60-day administrative leave, effective immediately. “Today is a challenging day for the University of Idaho and Vandal Athletics,” Staben wrote in a statement announcing the action that was distributed at an athletics department meeting called on short notice this morning. Spear has been under fire since a Tumblr blog post in January was picked up by regional news media in recent weeks. In the post, former UI diver Mairin Jameson claims Spear, UI football coach Paul Petrino and other university officials did not respond adequately when she reported to them in 2013 she was being harassed and inappropriately touched by a Vandals football player, Jahrie Level. Spear acknowledged that acting under what he assumed were Title IX guidelines, he told Jameson the university could not investigate the inappropriate touching incident since it occurred off campus. That Title IX policy had, in fact, been changed before Jameson said she was assaulted by Level. Athletics department officials also did not report Jameson’s complaint to the Dean of Students, which would have triggered an opportunity for her to get counseling, nor did they tell her that Level had been removed from the football team and expelled. The ASUI heard testimony last week on a resolution calling for Spear’s employment to be terminated. Additional testimony and a vote on the resolution is scheduled for today. At last week’s meeting, Staben cautioned ASUI senators to proceed carefully in calling for Spear’s firing. Staben said in 2013 UI’s guidelines for responding to sexual assault and harassment claims were not as clear as they are now. He said Spear has been a leader among school administrators in promoting accountability among student-athletes and staff to intervene to stop harassment when they see it occurring. Pete Isakson, UI associate athletics director, who formerly worked for 14 years at the Washington State University Foundation, will serve as AD during Spear’s absence. “Pete is a Vandal alumnus and an experienced administrator. He will be a capable hand to guide us during the review period. Vice President for Finance and Administration Brian Foisy will work with the athletics business office to manage the finance functions of the department,” Staben wrote. Spear’s suspension comes as the university is the midst of making a final push to complete fundraising for a new basketball arena. Staben did not offer much in the way of a plan for the athletics department going forward, nor did he say anything specific about Spear’s ultimate fate. Published: April 3, 2018, 10:48 a.m. Updated: April 3, 2018, 6:21 p.m.